Netrolix leverages artificial intelligence to analyze network data to improve throughput by making more intelligent routing decisions. AI-WAN combines Netrolix Software Defined Gateways (SDG) with the company's Machine Learning controller technology that provides deep analysis of network routes to identify the least congested and fastest data path through the network. The Software Defined Gateway (SDG) is a multifunction network appliance that can be deployed as a router, switch, firewall, or SD-WAN appliance. 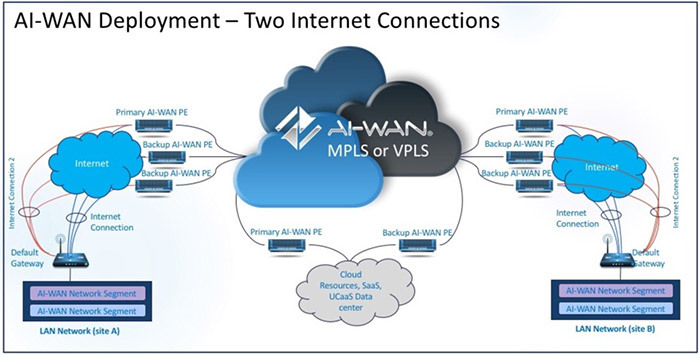 This provides full SD-WAN capabilities with intelligent switching of data across IP, multiprotocol label switching (MPLS), virtual private LAN service (VPLS), and virtual private network (VPN) connections, or it can be deployed as a termination point for carrier services. The Machine Learning controller platform analyzes real-time and historical information on network performance including data center locations, service provider tendencies, current congestion issues, time of day, and historical traffic patterns. Lastly, the Security Shield enhances these capabilities through the creation of unique security profiles for each device, location, and network in an enterprise. The Machine Learning technology analyzes data from these devices to spot traffic anomalies that are consistent with malware or network attacks. AI-WAN™ service provides instant MPLS, VPLS, and VPE (point to point Ethernet) built on a patented machine learning, neural network core that leverages millions of real-time and historic performance data that is fed into our machine learning platform. This data is collected from over 40,000+ global locations with performance visibility into every global Internet Service Provider. Netrolix Cloud Connect makes it easy to rapidly stand up a connection to your cloud provider like AWS or Microsoft Azure. You can leverage options like MPLS on the Netrolix AI-WAN™ platform to connect to multiple cloud providers in different regions coupled with flexible routing options. Netrolix's Security platform is built with internal deep learning, machine learning capabilities coupled with unique security algorithms. By dynamically learning your traffic patterns and adjusting accordingly we are capable of taking action to mitigate threats up and to complete lockdown for worst case scenarios. Every Netrolix Data Center is equipped with a fully functional SDN Based VPN Gateways. For the mobile workforce and remote project teams, having access to your private network resources is a must. Let us help you solve your connectivity problems like performance or local firewall policies and rules that impair your functionality. Netrolix offers its monitoring services as a stand-alone option. This service is best suited for those that simply need to centralize management and visibility on a single platform for existing devices and have a network in place. AI-WAN combines Netrolix Software Defined Gateways (SDG) with the company's Machine Learning controller technology that provides deep analysis of network routes to identify the least congested and fastest data path through the network. The Software Defined Gateway (SDG) is a multifunction network appliance that can be deployed as a router, switch, firewall, or SD-WAN appliance. The SDG provides full SD-WAN capabilities with intelligent switching of data across IP, multiprotocol label switching (MPLS), virtual private LAN service (VPLS), and virtual private network (VPN) connections, or it can be deployed as a termination point for carrier services. The SDG monitors other local networking devices to collect network statistics and to report back performance data required for remote management of these devices. Packet-related network statistics from the SDG are uploaded to the Machine Learning platform to be analyzed with data from other SDGs across the network in order to show network and equipment performance metrics. Configuration and management data is available via a web-based portal that enables remote installation of the equipment, along with ongoing configuration and performance and path analysis. The Machine Learning controller platform analyzes real-time and historical information on network performance including data center locations, service provider tendencies, current congestion issues, time of day, and historical traffic patterns. It also shows anomalies in the network to detect early security breaches or failures in equipment. The AI-WAN service uses real-time information to adjust for dynamic network conditions and route packets around congestion. These decisions get better over time as more data is collected and included in the analysis. This information contributes to selecting the data path with least congestion and fastest throughput, but also with best network uptime as data can be rerouted instantly around down networks. Enhances these capabilities through the creation of unique security profiles for each device, location, and network in an enterprise. The Machine Learning technology analyzes data from these devices to spot traffic anomalies that are consistent with malware or network attacks. When the system sees irregular traffic features on any of the connected LAN devices, it can alert the network manager or engage the UTM service to mitigate the impact of the attack.